Sod the submarines, can we please talk about the rifles? I applaud Defence Minister David Johnston’s willingness to stand up to vested interests to ensure that the Australian people get the best submarines available. I hasten to add that I don’t have a clue whether the Royal Australian Navy is best off with Sōryū-class subs or something else. To be perfectly honest, given that the Royal Australian Submarine Service hasn’t fired a shot in anger in 100 years, and seems highly unlikely to do so in the foreseeable future, I don’t really care. The same, however, can’t be said for the standard individual weapon of the ADF. In that same 100 years Australian diggers have fired millions of shots in anger with their Lee Enfields, SLR’s, M16’s and F88 AusSteyrs in life or death engagements with Australia’s enemies. While we can have lofty abstract debates over the strategic value of RAN submarines, there can be no debating that the lives of Australia’s military personnel rely on the effectiveness of the rifles they have been issued with. As such, Australia owes it to her armed servants to ensure that they are equipped with the best service rifle available. But that’s currently not the reality. In the 1970’s the Steyr AUG assault rifle (of which the F88 is a variant) seemed to herald the future. The bullpup design (which places the action and magazine of the weapon behind the trigger and pistol grip, alongside the firer’s face, thereby replacing the traditional buttstock) promised assault-rifle performance in an impressively compact package. That it certainly delivered, but at significant cost. One major disadvantage of the bullpup design over more conventional assault rifles is that most bullpups are not truly ambidextrous. Yes, it’s possible to switch the ejection port of the F88 to either the left or the right, depending on whether the shooter is left- or right-handed. But that just switches around which shoulder the rifle cannot properly be fired from. Because the action is to the rear, firing a bullpup from the ‘wrong’ shoulder results in the shooter receiving a face-full of scalding hot brass. 50% of the world’s cover is off-side for 100% of shooters, and modern military doctrine emphasizes the ability to fire effectively from either shoulder. 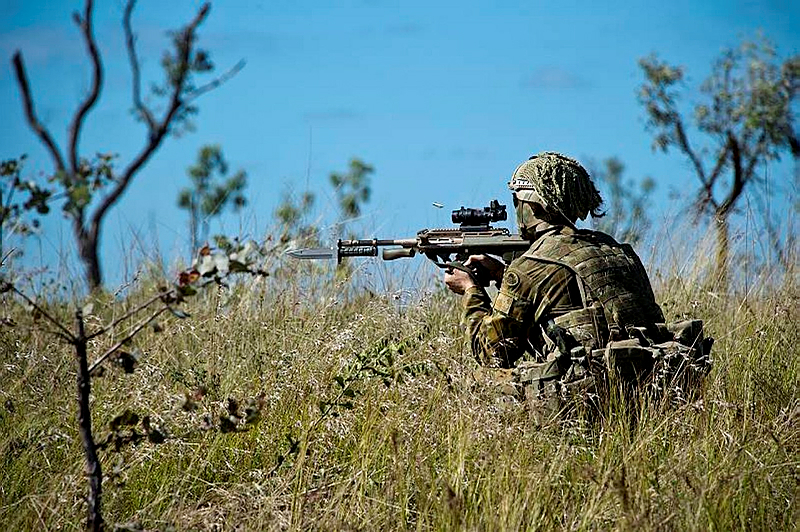 The F88 does not allow for that, which means that Australian soldiers must expose themselves to enemy fire in order to fire around ‘wrong side’ cover, placing their lives at unnecessary risk. Bullpups also cannot be adjusted to fit different-sized human beings. In firearms parlance that’s the issue of ‘length of pull’ (LOP), i.e. the distance from the trigger to the end of the buttstock. The LOP that’s optimal for each human being depends on height and corresponding arm length. If the LOP is too long it becomes difficult to reach and employ the trigger effectively, and to achieve an effective sight picture. 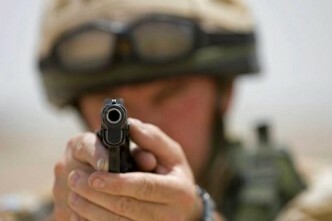 If the LOP is too short the shooter’s forced to ‘scrunch up’ on the rifle, again resulting in difficulty in attaining an effective sight picture. (By analogy think of the position of the driver’s seat in a car. If it’s too far from the controls…you get the picture). The F88 has perfect LOP if you’re an average-sized man, and you can manage okay if you’re a bit on either side of that. But if you’re particularly tall you’ll have great difficulty employing the F88 effectively. Perhaps more importantly, if you’re a short man, or a not especially short woman, you’ll also struggle. This is, as much as anything, an equity issue. If the ADF is serious about integrating women into its ranks—particularly into combat units—it’s absurd (and morally problematic) to persist in issuing a primary weapon that puts them at a significant disadvantage in a firefight. There are other problems with the F88, but I hope this is enough to illustrate that the current plan of continuing on to another version of the F88 (the Enhanced F88) that does little or nothing to address those issues is a pretty bad idea. So what’s the alternative? There’s only one answer—the M4 Carbine employed by our U.S. allies. It’s lighter, cheaper, and more robust than the F88. It’s modular, battle-tested, constantly refined, truly ambidextrous, and fully adjustable. The M4 beats the F88 hands down. Of course you shouldn’t take my word for it—instead, try asking the operators of the ADF’s elite special operations units whether they plan on turning in their M4’s when the ‘enhanced’ F88 begins production. But don’t expect a polite answer. So, will Minister Johnson stand up to those with vested interests in this case? Deane-Peter Baker is a senior lecturer in the School of Humanities and Social Sciences at the University of New South Wales, Canberra. Image courtesy of Department of Defence.